When we think of organizing small living spaces we must first have a plan. You will soon realize that you use very few things on a daily basis. You will also find that if you do not use something for a year...it has got to go. Living in small spaces means you should be careful not to clutter. After all one of the prime motivators to move to a smaller space is you need less not more. 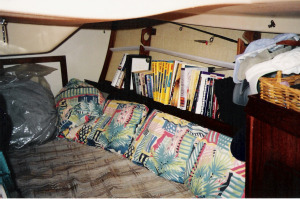 Here is the aft cabin on Shadowtime, we also called it the garage. It was where we stored items we bought in bulk (beer, paper towels, etc). It is in a clean situation right as pictured. We all need storage, but it is more important to keep it neat the smaller your living space. You have to take my word for it but underneath the berth cushions were 6 areas of storage, accessed by a strong cover with a hole in it for a grip. Because this wasn't the most accessable area we tended to put items in these cubby holes that were not used every day. Being close to the engine, we kept new oil filters, V belts, exhaust hoses, hose clamps, etc in this area. Organizing small living spaces always means keeping vital parts easily acessible. We kept 2 inventory lists on the boat both in 3 ring binders. One was an alphabectical listing of everything we had on the boat, with where it was. The V belts might have a notation of aft cabin, under berth cushion, #D.
We had the 6 storage areas under the cushions marked A to F. When you neded a Vbelt for the engine it usually happened when you were approaching a fuel dock...you don't have a lot of time...you needed to know where it was. After 8 years we had a pretty good handle on things but I know I referred to the list every other day. A inventory list is a must when organizing small living spaces. The other list was what was in each storage area. I could look and tell that #C in the aft cabin was where the oil filters were kept. This may sound a little much but the smaller the space the more important it was to know what was what. OK let's step off the boat and see how we can apply this to a studio apartment, of 500 square feet, that's small space living. I had just an apartment in San Francisco when I met my bride of now 34 years. Then every year do the same thing... take evertything out and put it back. 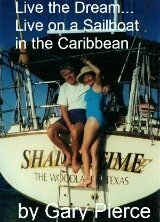 We had a rule on the boat, except for vital spare parts, if we didn't use it that year off it went. Your storage is just too valuable to kep stuff you don't use. Get rid of it...really. Sounds harsh but we are talking small living spaces here. RVs and park model living require the same discipline...know where your stuff is and keep only what you use. doable as long as you give priority to organizing small living spaces...no matter how small. After all in a home you are dealing with vertical surfaces...on the boat they are rounded. Enjoy.